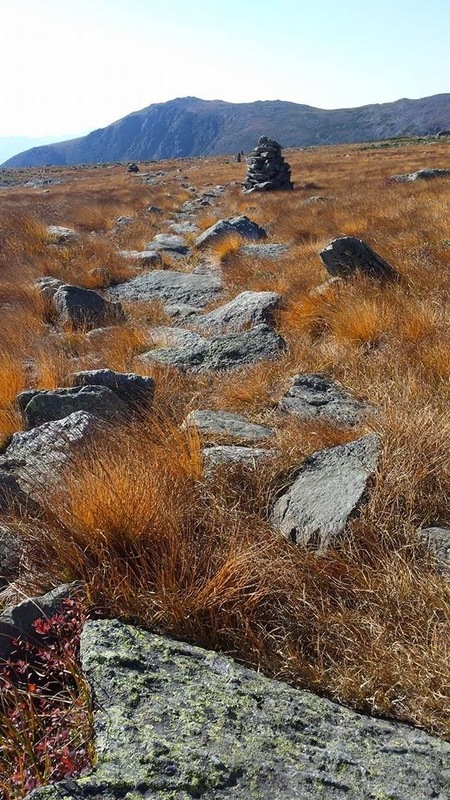 AMC Conditions: Foliage in Huntington Ravine and the Alpine zone! Foliage in Huntington Ravine and the Alpine zone! Nothing says fall in the Whites like a beautiful alpine start to enjoy the foliage as the sun rises. This days itinerary was to hike up to the base of Huntington Ravine to watch the sun rise, over the alpine garden and then down Boot Spur. My "team" consisted of some righteous babes. Our designated photographer of the day was a good friend from Great Glen Trails my partner in crime from the Forest Service and I, newly certified emergency medical technician who needed some decompression. 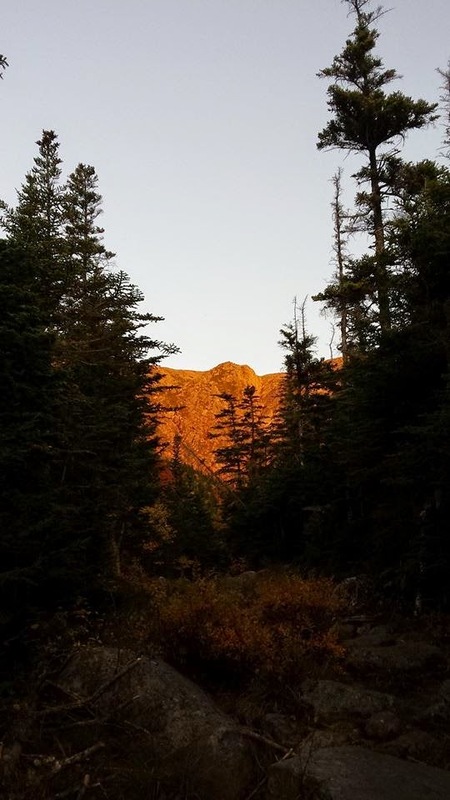 The day started off at 5am starting on the Tuckerman Ravine trail in the dark. This trail has seen a lot of reconstruction in the past 2 weeks. Expect deep water bars and many less rocks. To someone who knows that trail like I do, it will feel unrecognizable especially without daylight. We started up the Tuckerman Ravine Trail, which starts just out back from the Pinkham Notch Visitors Center/Joe Dodge Lodge. After cruising the 1.2 miles up to the junction, we turned right on the Huntington Ravine Trail. We made our way to the Huntington Ravine trail where we continued up to the ravine. We passed the cutoff for the Harvard Cabin right as the sun was about to crest the mountains causing an alpine glow(pronounced Al-pin) that made all of the foliage colors pop more vibrant than I've ever seen. Once we got into the base of the ravine we hung out on my favorite rock sipping coffee waiting for he sun to fully crest into the ravine to warm the rocks up. Looking back we should have gone before because it was so hot in the sun! From here on, the trail should be taken with extreme caution and should only be done by well prepared experienced hikers. The trail makes its way through a boulder field before it starts a steep climb up a slab of rock. It continues being technical hiking with mandatory hand placements. One must not to forget however to turn around and take in the beauty of the foliage in the trees below. We topped out around 8am and after doing a little loop towards Nelson Crag we continued on the Alpine Trail. Boy was that trail a treat! We were able to relax our nerves and enjoy all the orange and reds from the alpine plants. We relished in the silence and sun until we got to the Tuckerman Ravine trail where we could count up to 20 people making their way to the summit. We scooted pass them continuing to the Crawford Path (below the summit), down the Davis Path to the Boot Spur trail. Here we rested and prepared for our first bit of downhill for the day. Boot Spur was far better than I expected. 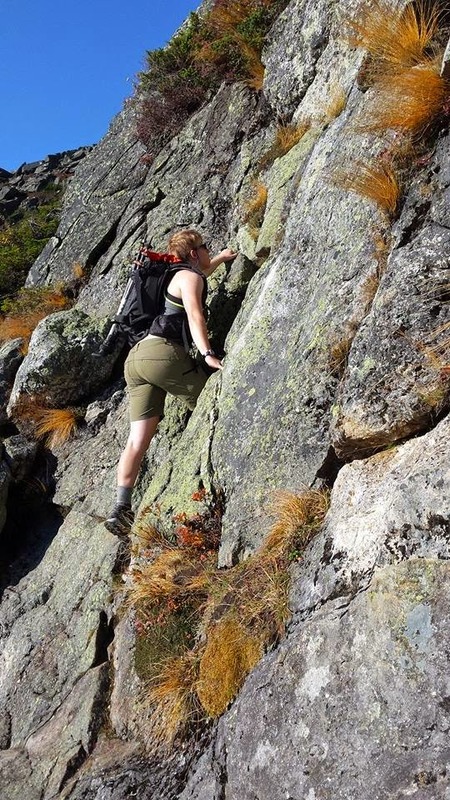 It wasn't nearly as steep as the Glen Boulder trail and offered fantastic views into Tuckerman Ravine and Gulf of Slides. I definitely recommend this loop to anyone who is experienced, not afraid of heights and looking for a way to enjoy the views without the crowds. From car to car it took us just under 9 hours with lots of glorious rest stops and starting at 5am meant that I got back home in the valley in time for an afternoon siesta. Be prepared. Plan ahead. Don't forget to have fun.